Looking for a healthier, more eco-friendly snack that is packed with protein and utterly sustainable? Well, put down the mixed nuts and snack on these tasty Mixed Bugs from the Newport Jerky Company instead. Sure munching on nutritious boiled and dehydrated bugs (never fried) may sound a bit disturbing now, but they just might be the future of snacks and the food supply in general. They're even gluten free. 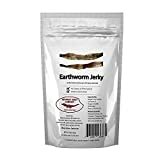 This bag contains an assortment of fully edible crunchy grasshoppers, mole crickets, silkworms, crickets, and sago worms to help get you started. Eat them right out of the bag, crush them over foods like salads or even ice cream, use them as the secret ingredient in your favorite recipes, or just dare others to try them for fun. Yum! Maybe.